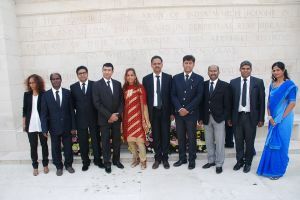 On Saturday 23 August 2014, a 25-strong BOPIO and GOPIO UKdelegation consisting members and their families, visited the Indian Memorial at Neuve Chapelle in France. They were received by Mr. Rajaram Munuswamy, Secretary General Gopio International, and senior members of GOPIO France, who hosted the day. Also present to welcome the visitors from Britain was the Mayor of Neuve Chapelle Ronald Lieven, who warmly greeted his guests and welcomed them with some well-chosen words. This Memorial commemorates over 4,700 Indian soldiers and labourers who lost their lives on the Western Front during the First World War and have no known graves. The location of the memorial was specially chosen as it was at Neuve Chapelle in March 1915 that the Indian Corps fought its first major action as a single unit. GOPIO Europe proposes to celebrate 100 years of this event next year. The celebration will include seminars, exhibition depicting sacrifices of Indian nationals for peace and freedom of Europe. Chan Chowdhry, Chairman BOPIO and President GOPIO Europe was overcome by the occasion and spoke movingly of the sacrifices of the Indian soldiers who fought thousands of miles from their home, in alien conditions of weather, culture and language. He wanted to make sure we remembered what these soldiers did and that that their sacrifices were not in vain. He asked the Mayor to allow GOPIO / BOPIO to install“Amar Jyoti” – an everlasting flame at the memorial. Leaders from GOPIO France echoed his sentiments. A proposal to build a non-denominational prayer room near the memorial site is to be discussed with all GOPIO chapters within Europe. Rajaram Munuswamy thanked the mayor of the city and the assembly and recalled the importance of remembering the Martyrs of the WW-I so that the world will never see such a heinous massacre again. He insisted the Gopio chapters to work on a common agenda for the benefit of the Indian Diaspora. The memorial takes the form of a sanctuary enclosed within a circular wall after the manner of the enclosing railings of early Indian shrines. The column in the foreground of the enclosure stands almost 15 feet high and was inspired by the famous inscribed columns erected by the Emperor Ashoka throughout India in the 3rd century BC. The column is surmounted with a Lotus capital, the Imperial British Crown and the Star of India. Two tigers are carved on either side of the column guarding the temple of the dead. On the lower part of the column the words ‘God is One, He is the Victory’ are inscribed in English, with similar texts in Arabic, Hindi, and Gurumukhi. The memorial was designed by the celebrated British architect, Sir Herbert Baker, and unveiled by the Earl of Birkenhead on 7 October 1927. Lord Birkenhead, then Secretary of State for India, had served as a staff officer with the Indian Corps during the war. The unveiling ceremony was also attended by the Maharaja of Karputhala, Marshal Ferdinand Foch, Rudyard Kipling, and a large contingent of Indian veterans. BOPIO & GOPIO plan to make the visit to Neuve Chapelle, an annual event. The event was concluded with the singing of Indian National Anthem. A Certificate of participation mentioning the Centenary Remembrance in Neuve Chapelle was released and given to all the members of the delegation who were present on the day. With gratitude to the office bearers of Gopio France Metropole : – Mr. Manivassagane Balane, Mr. Manimaran Ponnoussamy, Mr. Etienne Dubaille, Mr. Pinakin Desai, Miss. Fabienne Fifi, and Mrs. Stella Ponnoussamy for successfully organising the event.